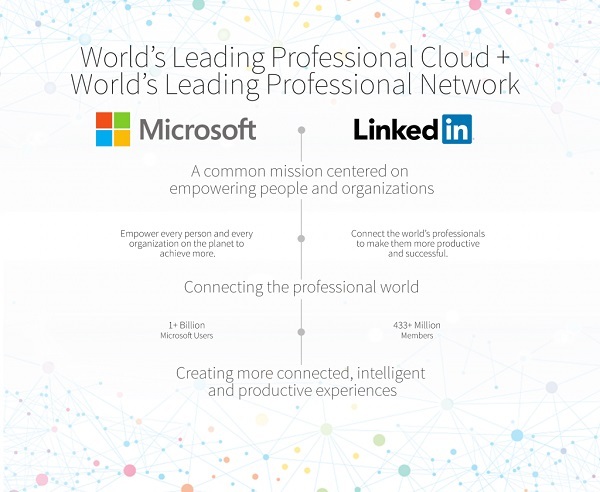 "The LinkedIn team has grown a fantastic business centered on connecting the world’s professionals," Nadella said. "Together we can accelerate the growth of LinkedIn, as well as Microsoft Office 365 and Dynamics as we seek to empower every person and organization on the planet." "Just as we have changed the way the world connects to opportunity, this relationship with Microsoft, and the combination of their cloud and LinkedIn’s network, now gives us a chance to also change the way the world works," Weiner said. "For the last 13 years, we've been uniquely positioned to connect professionals to make them more productive and successful, and I'm looking forward to leading our team through the next chapter of our story." The transaction has been unanimously approved by the Boards of Directors of both LinkedIn and Microsoft. The deal is expected to close this calendar year and is subject to approval by LinkedIn's shareholders, the satisfaction of certain regulatory approvals and other customary closing conditions. "Today is a re-founding moment for LinkedIn. I see incredible opportunity for our members and customers and look forward to supporting this new and combined business," said Hoffman. "I fully support this transaction and the Board's decision to pursue it, and will vote my shares in accordance with their recommendation on it." Microsoft and LinkedIn will host a joint conference call with investors on June 13, 2016, at 8:45 a.m. Pacific Time/11:45 a.m. Eastern Time to discuss this transaction. The call will be available via webcast at https://www.microsoft.com/en-us/Investor and will be hosted by Nadella and Weiner, as well as Microsoft Chief Financial Officer Amy Hood and Microsoft President and Chief Legal Officer Brad Smith. The presentation for the call is available on the Microsoft News Center. Morgan Stanley is acting as exclusive financial advisor to Microsoft, and Simpson Thacher & Bartlett LLP is acting as legal advisor to Microsoft. Qatalyst Partners and Allen & Company LLC are acting as financial advisors to LinkedIn, while Wilson Sonsini Goodrich & Rosati, Professional Corporation, is acting as legal advisor.